An important feature of the medical profession is to provide compassionate and empathic care to patients. Physicians need up to date knowledge and appropriate skills to provide better patient care.1 Professionalism is a core quality that needs to be understood and developed as part of becoming a doctor. It brings together many aspects of how a medical student learns about and contributes to the care of patients. A teachers’ professional attitude is a role model for learners. Medical educationists and teachers should foster the development of professionalism among learners. Both personal and environmental factors play a role in physician’s professionalism.2 Various factors contribute to professionalism, which may allow the development of more effective approaches to promote this quality in medical students. The purpose of this study was to estimate the self-reported level of practice of the core elements of professionalism by medical students and medical faculty and compare the two groups. The study comprised of a survey of medical students, clinicians, and teaching faculty members using a self-reported questionnaire. The questionnaire comprised of four sections. The first section consisted of demographic details of participants and sections two to four contained questions on professional knowledge and skills [Table 1]. Each question had five response options (strongly agree, agree, neutral, disagree, strongly disagree). The last section included the essential components of professionalism. Table 1: Students’ perception of their professional knowledge and skills. The ethical review committee approved the questionnaire, and participants were enrolled after obtaining written informed consent. Two research assistants were educated about the questionnaire and were trained in the data collection procedure, which included identification, recruitment, data collection, and obtaining written informed consent. The questionnaire was developed as a result of a literature search for studies of core elements of medical professionalism measures. The questionnaire was reviewed and finalized after several brainstorming sessions and discussions so that the questionnaire would maximize the validity and reliability. Previous studies have suggested methods to improve response rates by including a relevant topic, offering feedback, the length of questionnaires, and assurance of confidentiality, incentives, and personal contact. All questionnaires were included in the analysis, and there were no missing responses. Statistical analysis was performed using SPSS Statistics (SPSS Statistics Inc., Chicago, US) version 20.0. Data was expressed in frequencies and percentages for questionnaire responses that were numerical. Cross tabulation was performed to determine if there was a relationship between subgroups. The chi-square test was used for categorical data and the Mann-Whitney test to compare differences between two groups with non-parametric continuous data. Out of the 166 students (80 clinical and 86 pre-clinical) contacted for this trial, 109 students participated giving a response rate of 65.6%. The age of students ranged from 21 to 26 years with a mean age of 24.0±0.1. The majority of students were female (82.6%). Most students (60.0%) were in the seventh year of study (clinical year), and 40.0% were from the fifth year (pre-clinical year). Nearly two-thirds (n = 81; 74.3%) of participants were local, and the rest were international students. was not significantly different between the study group years. With regards to the student’s attitude, no significant difference was observed in all given options except patient safety (p < 0.030) [Table 1]. Table 2: Self-reported response on qualities for professionalism in fifth and seventh-year students. Fifth and seventh-year medical students were asked about qualities they thought were essential for professionalism [Table 2]. The top five qualities essential for professionalism as determined by the students are shown in Figure 1. The top quality was good communication (82.6%). Respect for others (35.8%) and physical and mental health (35.8%) shared the fifth place. Out of the 110 teaching faculty members contacted for this trial, 83 participated in the study giving a response rate of 75.5%. Figure 1: The top five qualities essential for professionalism according to medical students. Their age ranged from 30–57 years with mean age of 41.2±6.7 years. Of the total participants, 43 (51.8%) were female, and 40 (48.2%) were male. Over half (n = 51; 61.4%) were academic general practitioners, 15 (18.1%) were clinical faculty, and 17 (20.5%) were from the basic sciences faculty. Among participants from the clinical faculty, 22 (26.5%) had fewer than five years experience, 38 (45.8%) had 5–10 years’ experience and 23 (27.7%) had over 10 years’ experience. 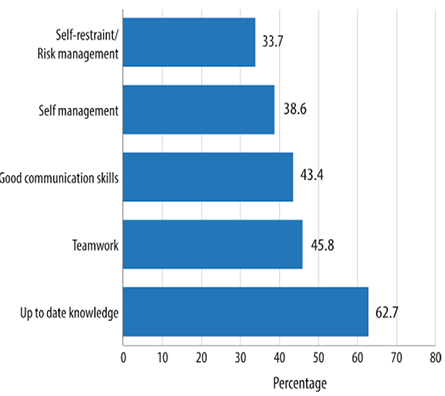 The faculty members perception of their professional knowledge and skills is shown in Table 3. A significant statistical difference was observed between clinical and basic sciences faculty members regarding up to date knowledge and clinical competency (p < 0.001). The perception of professional skills between the two faculty groups was not significant (p = 0.094). Study data showed that perception of professional attitude in the basic sciences and clinical faculty group was not significantly different (p = 0.267). Table 3: Faculty perception of their professional knowledge and skills. Table 4: Self-reported response on qualities for professionalism by clinical and basic sciences faculty members. Table 5: Comparison between faculty and students on their self-reported response on items of professionalism. Clinical and basic sciences faculty members were also asked about the qualities they believed to be essential for professionalism [Table 4]. They answered yes/no questions to determine the attributes they believed to be essential for professionalism. Sixty-two percent thought that up to date professional knowledge was an essential attribute [Figure 2]. We observed a statistically significant difference in gender with regard to logical/critical/creative thinking (p = 0.031), integrity/honesty (p = 0.055), and ethical thinking and behavior (p = 0.014) professional qualities. Figure 2: The top five qualities of practice or skills essential for professionalism according to faculty members. Students and faculty members had a significant difference in opinion regarding up to date knowledge of basic and clinical sciences and clinical competency (p = 0.024). Similarly, the perception of professional skills (p = 0.001) and attitude (p = 0.001) was significantly different between the two student year groups. In Table 5, we compared the responses of faculty members and students to attributes they believed to be essential for professionalism. Professionalism is a critical quality needed by physicians to provide competent and compassionate care to patients. It encompasses a set of values and behaviors that underpin the social contract between the public and the medical profession.15 Physicians should uphold the highest standards of ethical and professional behavior in all their actions and activities, the practice of medicine involves trust between the patient and their doctor. The sample size in this study limits the ability to generalize the results. However, some interesting trends highlight the need for further research. There are some agreements and some differences between students and faculty response, so further research is essential to determine the cause of such perceptional differences. Certain aspects of professionalism seem to be underdeveloped in medical students. To improve recognition of the relationship of physician self-care to the ability to care for patients, we need to recognize that personal and organizational factors influence the professionalism of individual physicians. These aspects of professionalism may need to be targeted for teaching and assessment so that students develop as professionally responsible practitioners. Students with a well-developed understanding of professionalism may be less involved in medical error and have the personal values to help them deal with error honestly and effectively. Swick HM. Toward a normative definition of medical professionalism. Acad Med 2000 Jun;75(6):612-616. Hilton SR, Slotnick HB. Proto-professionalism: how professionalisation occurs across the continuum of medical education. Med Educ 2005 Jan;39(1):58-65. ABIM Foundation. American Board of Internal Medicine; ACP-ASIM Foundation. American College of Physicians-American Society of Internal Medicine; European Federation of Internal Medicine. Medical professionalism in the new millennium: a physician charter. Ann Intern Med 2002 Feb;136(3):243-246. Reiser SJ, Banner RS. The Charter on Medical Professionalism and the limits of medical power. Ann Intern Med 2003 May;138(10):844-846. Shrank WH, Reed VA, Jernstedt GC. Fostering professionalism in medical education: a call for improved assessment and meaningful incentives. J Gen Intern Med 2004 Aug;19(8):887-892. Swick H, Szenas P, Danoff D, Whitcomb M. Teaching professionalism in undergraduate medical education. JAMA1999;282: 830–2. Epstein RM, Hundert EM. Defining and assessing professional competence. JAMA 2002 Jan;287(2):226-235. Kao A, Lim M, Spevick J, Barzansky B. Teaching and evaluating students’ professionalism in US medical schools, 2002-2003. JAMA 2003 Sep;290(9):1151-1152. Hatem CJ. Teaching approaches that reflect and promote professionalism. Acad Med 2003 Jul;78(7):709-713. Stephenson A, Higgs R, Sugarman J. Teaching professional development in medical schools. Lancet 2001 Mar;357(9259):867-870. Whitcomb ME. Medical professionalism: can it be taught? Acad Med 2005 Oct;80(10):883-884. Coulehan J. Viewpoint: today’s professionalism: engaging the mind but not the heart. Acad Med 2005 Oct;80(10):892-898. Arnold L. Assessing professional behavior: yesterday, today, and tomorrow. Acad Med 2002 Jun;77(6):502-515. Henderson P, Johnson M. An innovative approach to developing the reflective skills of medical students. In: BMC Medical Education.2002. Adkoli BV, Al-Umran KU, Al-Sheikh M, Deepak KK, Al-Rubaish AM. 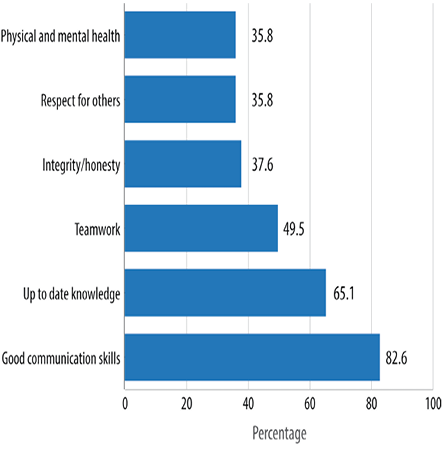 Medical students’ perception of professionalism: a qualitative study from Saudi Arabia. Med Teach 2011;33(10):840-845. Byszewski A, Hendelman W, McGuinty C, Moineau G. Wanted: role models–medical students’ perceptions of professionalism. BMC Med Educ 2012;12:115. Kenny NP, Mann KV, MacLeod H. Role modeling in physicians’ professional formation: reconsidering an essential but untapped educational strategy. Acad Med 2003 Dec;78(12):1203-1210. Ginsburg S, Regehr G, Hatala R, McNaughton N, Frohna A, Hodges B, et al. Context, conflict, and resolution: a new conceptual framework for evaluating professionalism. Acad Med 2000 Oct;75(10)(Suppl):S6-S11. Ginsburg S, Regehr G, Lingard L. The disavowed curriculum: understanding student’s reasoning in professionally challenging situations. J Gen Intern Med 2003 Dec;18(12):1015-1022. Ginsburg S, Regehr G, Lingard L. Basing the evaluation of professionalism on observable behaviors: a cautionary tale. Acad Med 2004 Oct;79(10)(Suppl):S1-S4. Cruess RL, Cruess SR, Johnston SE. Professionalism: an ideal to be sustained. Lancet 2000 Jul;356(9224):156-159. Cruess RL, Cruess SR. Teaching professionalism: general principles. Med Teach 2006 May;28(3):205-208. Ainsworth MA, Szauter KM. Medical student professionalism: are we measuring the right behaviors? A comparison of professional lapses by students and physicians. Acad Med 2006 Oct;81(10)(Suppl):S83-S86. West CP, Shanafelt TD. The influence of personal and environmental factors on professionalism in medical education. BMC Med Educ 2007;7:29. Stegers-Jager KM, Cohen-Schotanus J, Themmen AP. Motivation, learning strategies, participation and medical school performance. Med Educ 2012 Jul;46(7):678-688. Yera H. Core Elements of Medical Professionalism for Medical School Applicants. Korean J Med Educ 2006 Dec;18(3):297-307. Mann KV, Ruedy J, Millar N, Andreou P. Achievement of non-cognitive goals of undergraduate medical education: perceptions of medical students, residents, faculty and other health professionals. Med Educ 2005 Jan;39(1):40-48. Hur Y. Are There Gaps between Medical Students and Professors in the Perception of Students’ Professionalism Level? Yonsei Med J 2009;50(6):751-756. Lynch DC, Surdyk PM, Eiser AR. Assessing professionalism: a review of the literature. Med Teach 2004 Jun;26(4):366-373. Huddle TS; Accreditation Council for Graduate Medical Education (ACGME). Viewpoint: teaching professionalism: is medical morality a competency? Acad Med 2005 Oct;80(10):885-891. Howe A. Professional development in undergraduate medical curricula–the key to the door of a new culture? Med Educ 2002 Apr;36(4):353-359.